Good evening peeps I'm trying out different mediums at the moment, usually as you know I'm a big fan of Promarkers.....I still am..but I want to be able to use other mediums also so I dont have to rely on 1 if that makes any sense. I see different blogs all using dif technics etc & each & every 1 of them are fab, I especially love the look of distress ink & Prisma pencils on Magnolia's Tilda & Edwin........ Well I've done 1 so far using Distress Inks which is on my other blog cus I forgot to put it on this 1........I'm still getting used to having 2 blogs lol. Also for some reason I cant get my link to my other blog working, its probably me doing something wrong, my dizzy brain does go haywire at times & misfuntions lol. http://www.stickywithicky.blogspot.com/ here is the link if any1 would like to pop over & look around. Right where was I.............oh yeah thats it, I've now used 2 mediums altho the distress inks I still need plenty of practice but eventually it will get better(I hope!!!!). Tonight I have done a card with a Tilda image coloured with Prisma colours & using Sansodor.....I really enjoyed using this medium & I found it really easy, the easiest out of all of them actually not to say though that I'm still learning & still have plenty to learn but I didn't make a bad start. I've also got Derwent pencils as well but I'm struggling getting the right skin tone colour with them & have not used them except for an hour when they 1st arrived!!!! I'm not quite sure if you can see but there is stickle glitter around the edge of her pretty umbrella, she also has a bit of sprinkling of glitter over her but it was hard to catch this in the camera. The ingredients for this card are papers are from K&Co, its from their Big Stack of 360 sheets... there are SOOOO many gorgeous papers in the pack that I am ALWAYS spoilt for choice. The flowers & butterfly I got from Ebay as to the Broderie Anglaise. The sentiment was from a craft shop about 18 months ago when I 1st tried card making. I distress the card with Tumbled Glass distress ink before adding any papers, I also did the same with every layer that went underneath K&Co paper. I wanted to keep it summery but a bit lady like too as I think Tilda deserves that on this image......she looks so pretty dont you think???? I think thats it, I hope you like this card & if any1 has any tips about colouring with different mediums I really am all ears....I will take any advice I can get. Thank you for taking the time to visit me & a big big big thank you for your lovely comments I appreciate all of them with all my heart. Well TTFN for now as they say up here I'm howay to put my heed on my pillow lol. 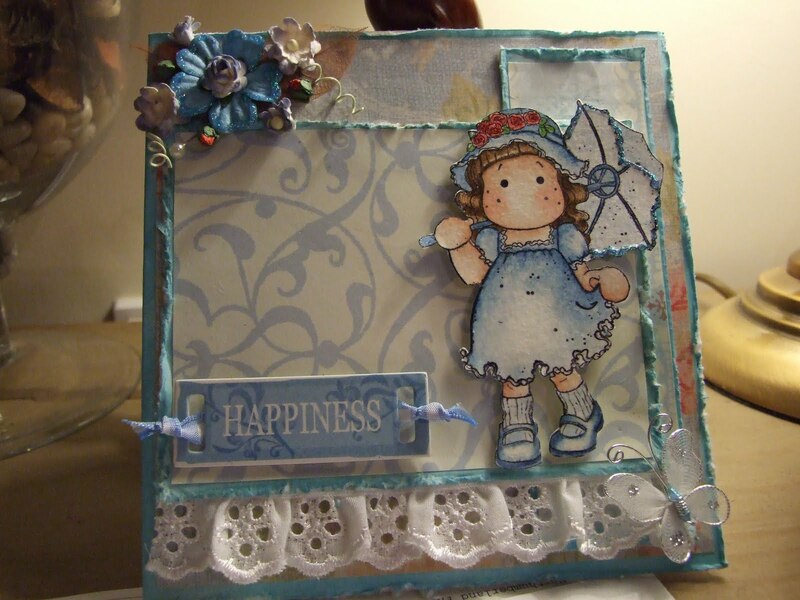 What a lovely card, really love all the distressed edges and the colours choice is perfect. This is a really beautiful card. I love the distressing and pretty lace. 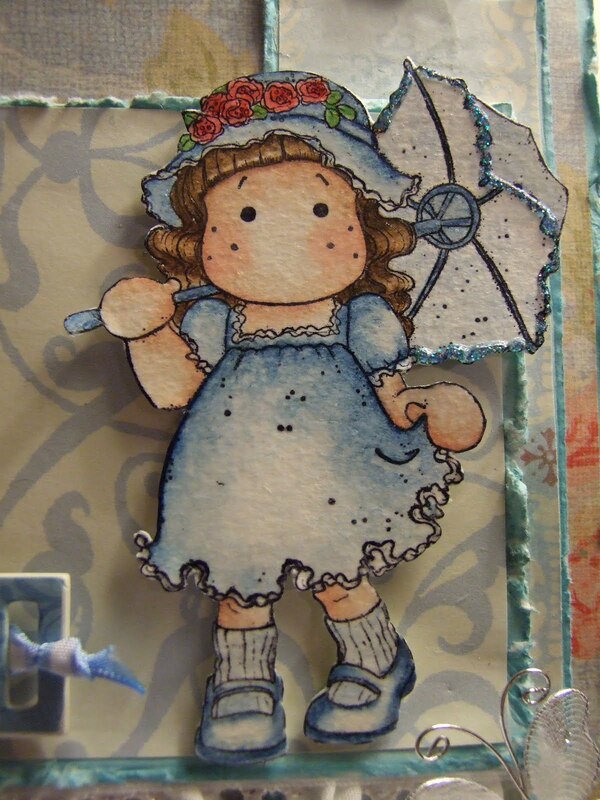 wow this is really beautiful vicky, tilda looks fab with her little umbrella and love your colouring,fabby papers and love the lace and detailing.totally gorgeous. 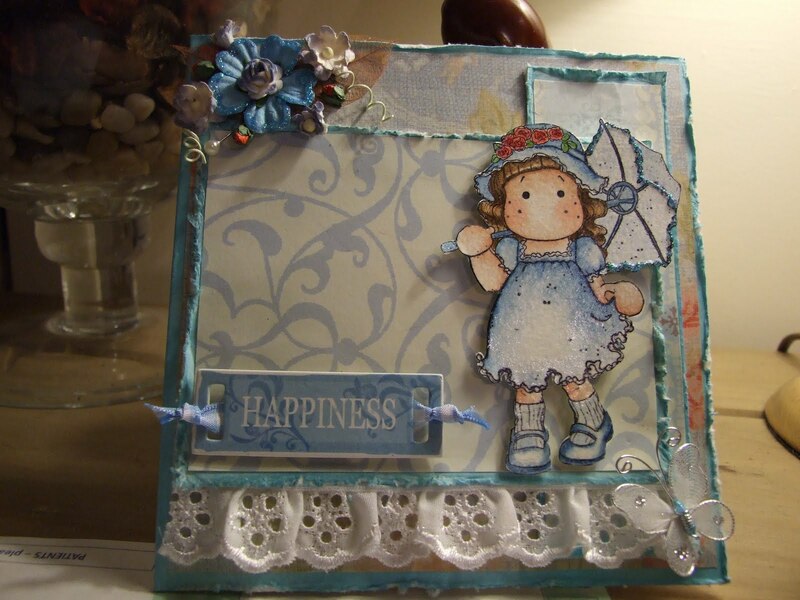 Such a pretty little card Vicky, love the soft blue colours and the added lace. Thanks for joining us at Sir Stampalot this month. Gorgeous work! Thanks for sharing your Summery design with us at Sir stampalot! wow!! watta nice card, ur so talented.